Acrylics Anonymous, Issue #047 -- Go Big Or Go Home. 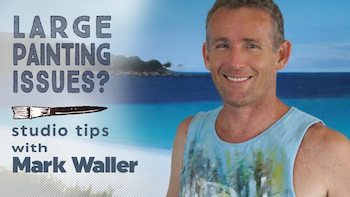 Overcome your large format painting issues in this new clip exclusively filmed for you! When making a large painting or mural have a good look at the image first, and really look and decide what information you can leave out. Getting caught up in detail is a trap with big work - you can be stuck there in all that glorious detail for years. Our candid and comprehensive interview with Joe Cornelius will inspire and motivate you to get out there and keep on learning! Rejoice, because there are workshops coming up in QLD, WA and Fiji in the coming six months. Make sure you’re on our workshops mailing list for all the latest workshops news. Click here to join our workshops mailing list. Tamara Vogrin Tara was born in Slovenia in 1975, and creates large scale portraits and murals to inspire you to go get some big canvas and get throwing paint around!. Click here to check out Tamara’s work. And a little bit of wisdom from Gabor Svagrik, renowned oil painter. There must be something in the air in Arizona!! Click here for Gabor’s word on why bigger is not always better! This month’s work comes from artist and tutor Michael in Massachusetts. “Hey everyone! My name is Michael Capers. I live in the States, Massachusetts exactly. I have been a professional artist for about 10 years now. I’m happy to say that I still learn new things every time I pick up a brush. Currently, I am the owner of The Art Lab & Gallery in Auburn Massachusetts. There, we teach kids and anyone interested, how to become a better artist and how to enjoy being creative. I’m going to walk you through one of my pieces and the process I generally use. As I looked at my gallery of work, I realized that there was a lack of a “conversation piece”. I wanted to spark some emotion in the viewer. 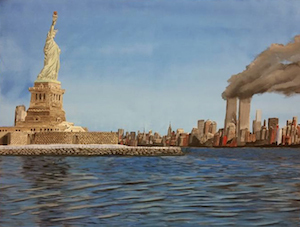 I chose a 9/11 landscape. Here is my process. I’m using acrylic paint on a 91cm x 121cm canvas. First I used a reference photo, (not pictured) and sketched the landscape. I wanted lots of detail, so I took my time. 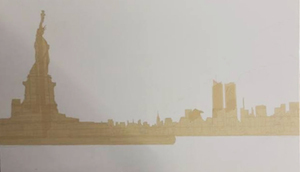 I then used masking take to cover the skyline and statue. I trimmed the edges with an exact-o blade being verrrrry careful not to cut the canvas. I then painted a gradient sky; getting lighter the closer I got to the horizon. I used a darker mix of the sky color to paint a base color in the water. I then removed the masking tape. Using a “Z” pattern brush stroke, I began adding the shadowy darker part of the waves and the waters movement. This part is important because if the water looks bad, the background will look out of place and it will be a big mess. Next I added the brighter sky color to the water’s surface to show the flatter areas, which reflect the sky. 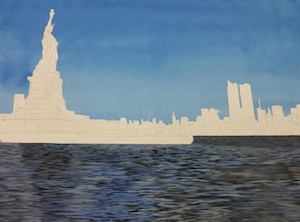 I added less highlights to the areas of the water, which would have shadow from the horizon and the statue. The water in the distance and closer to the shore is darker to give the impression of current change, shadow, and distance. 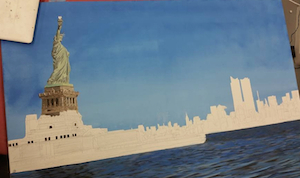 I began painting the green colors of the statue and made sure the shadows and highlights were as accurate as possible. I wanted as much detail as possible in the rocks and brick of the base and island, so I took a full day meticulously sculpting it. 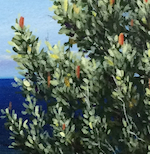 When painting a landscape, the objects in the distance will have less detail because they are so far away. To help create this illusion, I made sure the island was very detailed in contrast to the distant shore. I debated whether to leave the sky open or add something to it such as some fighter jets or an inspirational quote. I think the open sky says enough. I also think that putting words in the sky would look tacky and cheapen the overall painting.